This entry is part 5 of 16 in the series Belgium in a Glass. 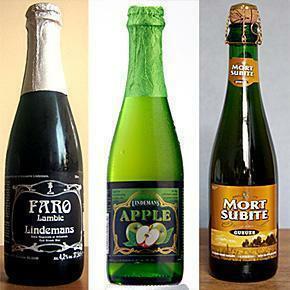 3 Belgian Lambic Beers – Lindemans Faro and Apple beer and Mort Subite Gueuze. There’s something special in the air around Brussels. No it isn’t just the delicious smell of waffles or frites! It’s the natural yeast and bacteria used to produce Lambic, one of the most unique types of beer in the world. With all the pollution in a major city, like Brussels, it‘s hard to imagine the air could also contain something benifical and non-toxic. Anyone who has tried to ride a bike or walk, on a particularly smoggy day, would be forgiven for wondering how even humans can survive. However, a special area southwest of Brussels, called the Pajottenland, is the exception to the rule. Here, the air contains special yeasts and bacteria, used by brewers, to produce flat, still Lambic beer. Producing beer requires the conversion of sugar into alcohol, called fermentation. In normal beer production, specially cultivated yeast is manually added by the brewer. By contrast, the fermentation of Lambic beer happens spontaneously. After the ingredients have been brought together, boiled and filtered, the result, called wort, is cooled in an open, shallow vat that fills an entire room. When the room’s windows are opened to promote air flow, airborne yeasts also enter and settle into the wort, beginning the spontaneous fermentation process. Researchers have identified the presence of 100 different strains of airborne yeast in this part of Belgium. Although yeast exists in the air elsewhere, the production of Lambic style beer is primarily a Belgian tradition. A pure Lambic beer is flat, because it spends up to 3 years in a barrel, where any carbon dioxyde seeps through the wood. When you drinka Lambic, you will immediately notice it is very dry and sour. In fact it will get your mouth watering! In my opinion, Lambic beer is not for everyone. The sour, dry taste of a pure Lambic will likely turn most people away from the product. The good news is there are other options which use Lambic as a base. Gueuze – In spontaneous fermentation the conditions will affect the flavour for each batch of beer. Thus, brewers blend several different years and ages of Lambic together, to produce Gueuze. Unlike Lambic, this beer is sparkling, because it includes very young Lambic whose carbon dioxyde hasn’t yet escaped. Gueuze is still more sour than a typical ale, but it is sweeter than a pure Lambic. In fact it is a nice beer to pair with seafood and a hot terrace. Fruit beer – Brewers also mix their Lambic beer with fruit, producing slightly sweeter, more rounded flavours. Typical fruits are cherries (kriek), raspberries (frambozen), grapes, apricots and peaches. Some breweries use fresh fruits, others will use syrups, which create a sweeter flavour. I feel the use of fresh fruit makes for a better result, but it will depend on your own tastes. Fruit Lambics are still typically sour and dry, but the different flavours open them up to new possibilities. Consider a raspberry or cherry Lambic with dark chocolate desserts like a moelleux au chocolat. Yum! 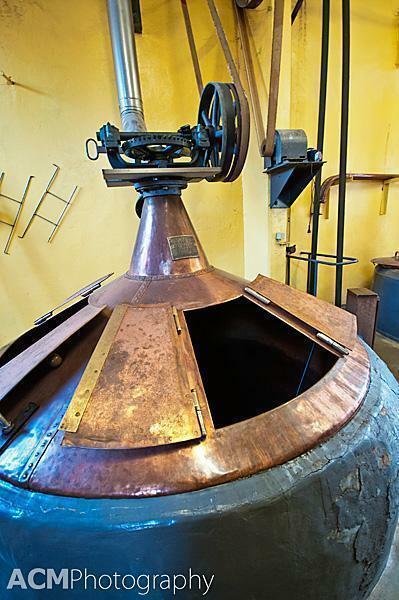 Faro – Since sour is not to everyone’s taste, brewers also bottle beer with brown sugar added. This gives the beer a bit more of a candy caramel flavour with a sour finish. I’d look to pair this with a stew or some heavy desserts. To get a better understanding of Lambic, Gueuze and the process, I strongly recommend a visit to the Cantillon Brewery. This is the last remaining brewery within Brussels and an easy walk from the Brussels South (Midi) train station. For 6€ you get an overview of the process, the ability to wander through their brewery and a sample of their beer. 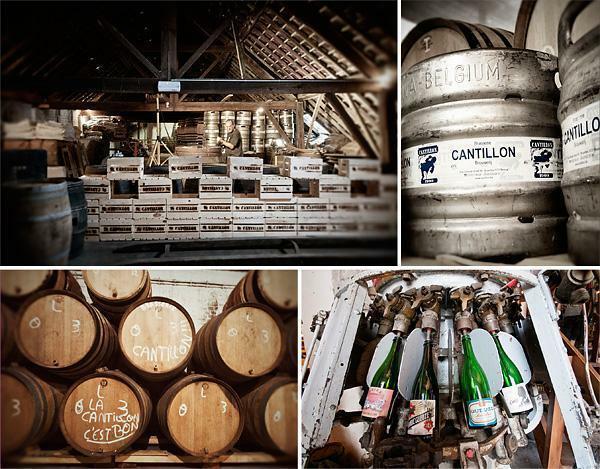 Visiting Cantillon also feels like stepping into the past because the building and most of their equipment is over 100 years old. At the Cantillon Brewery in Brussels you can see the spontaneous fermentation process in action. 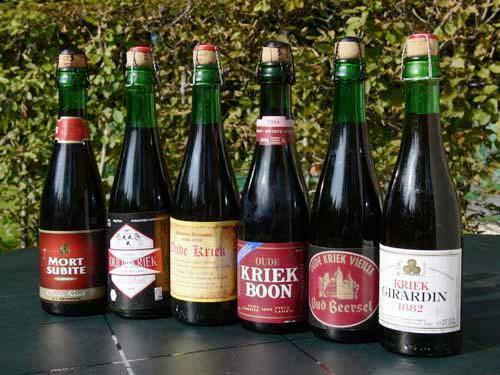 Boon Kriek – I am not normally a fan of fruit beer; I find them either too sweet or too sour. However, I had this cherry beer from Boon recently and found it to be really enjoyable. It was a nice balance of flavours and neither sickly sweet nor terribly sour. This is a nice drink on a hot day or with a bit of bitter chocolate. Girardin 1882 Fond Gueuze – Yes, it’s sour, but give it a chance. It is a refreshing beverage on a hot day; smooth, and dry, with a hint of fruit. It is a beer I would pair with cheese or seafood. Maybe even moules frites! Mort Subite Oude Kriek – Although owned by Heineken, the Mort Subite brewery still operates just outside Brussels and runs a café in the center of Brussels. Their old cherry beer is a bit more tart than Boon’s, but it has a nice cherry aroma. I’d recommend enjoying one of these at the Mort Subite café, preferably on the terrace. Lindemans Pecheresse, Framboise and Apple – Although not a beer drinker, Alison enjoys this range of fruit beer. The Apple is quite similar in taste to an English cider. The Pecheresse, or peach beer, has an almost wine-like quality. The Framboise is tart and tangy, without the syrupy sweetness of some of the other fruit beers. The most difficult thing about this type of beer is you need to try a lot to find ones you like. I’ve certainly not tried every possible Gueuze, Kriek, or Faro out there, but I do intend to try! What is your prefered Lambic, Gueuze, or Fruit beer? Share your recommendations in the comments below.